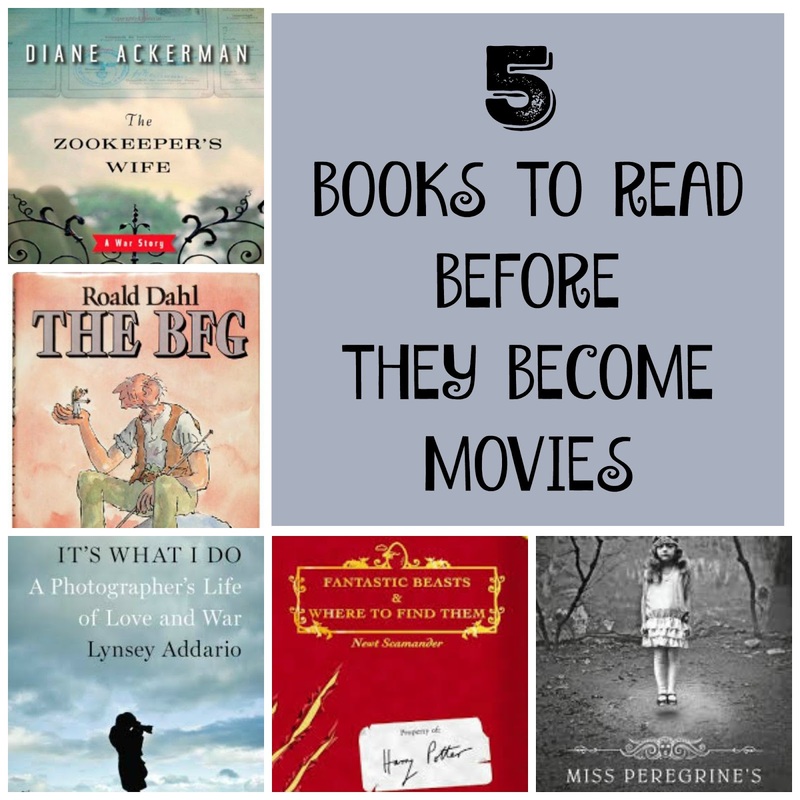 Book lovers have always been wary of their favorite books being made into movies. There are some, that are written so perfectly, and others that leave out so many details, or even change the ending! Some of my favorite book to film adaptions are "The Perks of Being a Wallflower" and "The Hunger Games." I haven't seen the second part of "Mockingjay" yet but I actually thought that "The Hunger Games" films were better than the books! I thought the first two Harry Potter films were incredible, was disappointed with the third, and will never forgive the fact that Neville's back story (the scene where Harry, Ron, and Hermione run into him visiting his parents at St. Mungo's, and the fact that Neville could have just as easily been "The Chosen One") was left out of of "The Order of the Phoenix." One of the categories on my #planestrainsandbooks challenge is to read a book that is being turned into a movie this year. If you're participating in the challenge, or even if you're not, here's a list of books I've read with film adaptations being released this year (in order of how excited I am about them)! 5. 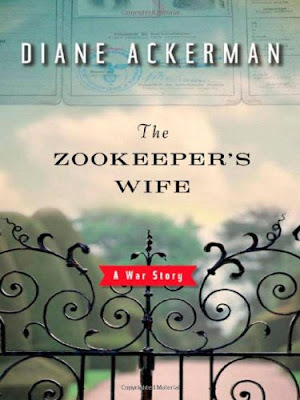 "The Zookeeper's Wife" by Diane Ackerman - I actually didn't like this book. I didn't think that there was enough material to make into a novel. Based on the true story of a zookeeper and his wife who hid Jews from Nazis in their zoo in Poland during WWII, this book fell flat but I do think it will make an incredible film. With Jessica Chastain starring, I think this will be one example of a film that was better than the book. 4. 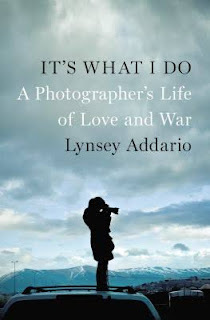 "It's What I Do: A Photographer's Life of Love and War" by Linsey Addario - I haven't actually read this yet, but it's been on my to-read list for awhile. A memoir, this book details Linsey Addario's experience as a photographer in Afghanistan, covering both the front lines as well as the human cost of war for Afghan civilians. The film will star Jennifer Lawrence as Addario with Steven Spielberg directing. 3. 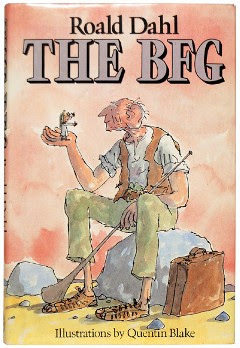 "The BFG" by Roald Dahl - This was one of my favorite books growing up and I reread it last year as part of the book challenge I was doing. It's a children's story about a little girl named Sophie who gets kidnapped from her orphanage by the Big Friendly Giant who transports Sophie to Giantland, where they become fast friends and set out on a plot to save all of the children of the world from being guzzled by giants. Steven Spielberg is directing the Disney film with Penelope Wilton set to star as Queen Elizabeth. 2. 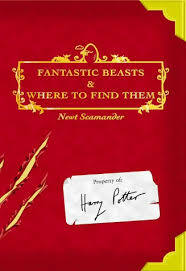 "Fantastic Beasts and Where to Find Them" by JK Rowling - "Fantastic Beasts..." is a Hogwarts textbook so I was surprised to see that it will be turned into a movie but I guess that means they can't really screw it up. It's being directed by David Yates, who did the last four Harry Potter films and stars Eddie Redmayne, who is the celebrity love of my life. Colin Farrell and Jon Voight will star as well. 1. 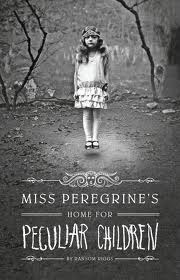 "Miss Peregrine's Home for Peculiar Children" by Ransom Riggs - Growing up, I always loved the fantasy genre. My mom read about "Harry Potter and the Sorceror's Stone" in the New York Times when it was first released and picked me up a copy and my life was forever changed. This was the best fantasy-genre book I've read since Harry Potter. If you haven't already, please pick up a copy of this book. The third and final book in the series was released this past fall and I loved the way the story ended. Directed by Tim Burton, the film will star Judi Dench, Samuel L. Jackson and Allison Janney. I'm a little wary of Tim Burton directing, but this is one that I'll see right away. Which ones are you excited to read and or see? 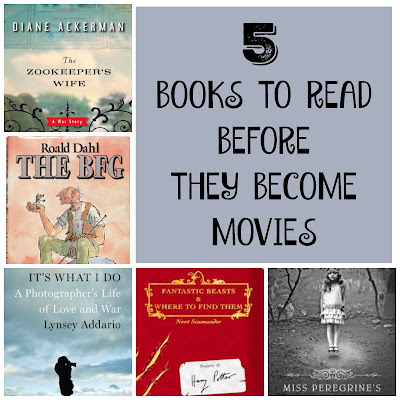 What books that you love have been optioned for film? Liked this post? Click the icons below to share it!